Our product range includes a wide range of electric bogie hearth furnace. We are successfully ranked amongst the topnotch entity offering a wide range of Electric Bogie Hearth Furnace. The offered furnace find wide application use in annealing, normalizing, tempering and solution annealing of large parts or welded constructions. 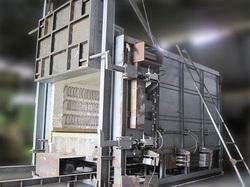 The offered furnace is made available in one- or two-door design as per the clients’ needs. Provided furnace has bogie on rails, electrically driven and supports frame made of refractory material or heat resistant steel. Apart from this, clients can get the furnace from us at industry leading prices.